T is for tired. The tournament was terrific - we couldn't have asked for a better day from Mother Nature. But I left the house at 6:30am - and didn't return until 11:0opm! So I am pooped! U is for umpteen....which is the number of blogs in my reader I need to catch up on!!! V is for Vote! 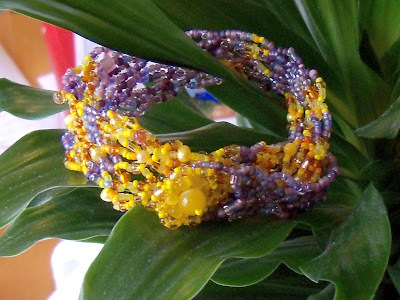 I received a note from another Beading Daily member asking for a vote for Bead Star 2011, and recalled that I also submitted to this contest, and it turns out my Margie & Me challenge piece was selected for the seed bead category. If you are a Beading Daily member - I would LOVE your VOTE! Thanks!!! Beautiful Piece Amy- will head over to vote! This is a beautiful bracelet. It makes me think of the flowers of spring. Thanks for letting me pop by... Your bracelet is very beautiful... the colors are fantastic. Yep Voted and as you can see I am trying to catch up too!